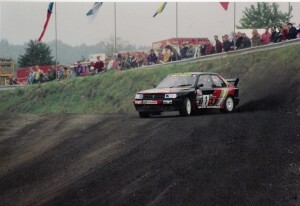 Will Gollop's Peugeot 309 T16 car replaced his European Rallycross Championship winning MG Metro 6R4 BiTurbo and debuted in April/May 1993, the first European event was Portugal. Gollop's switch to the all-new Silkolene-backed Peugeot 309 was never destined to be easy, much as the Whitstable driver would have liked it to have been! 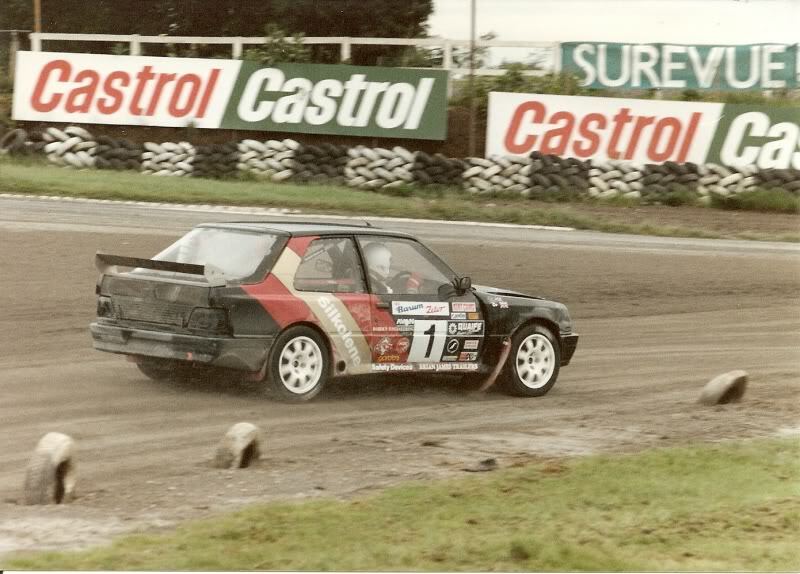 The year before had been nothing short of remarkable, with victory in the European Championship and crowning the year with his 3rd win in the Autoglass British Rallycross Grand Prix. It was always going to be a tough act to follow, little did Will realise how tough. The Peugeot 205 Turbo 16 was designed to win World Rally Championships (and it did). The T-16 derived technology was bolted to Gollop's 309. When European Rallycross Will Gollop announced that he would be driving a Peugeot in 1993 there were knowing nods of approval from the rallycross fraternity. 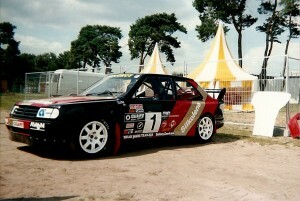 The 205T16 E2 had won four titles from 1987 to 1990. However, there were questions over Gollop's choice when details of the package that would make up his Silkolene Peugeot 309T16 'Supercar' were released. He decided to opt for 1750cc Peugeot engine based on the 'evolution one' 205T16 motor and a Quaife transmission. Gollop had a good understanding of engineering but despite the trouble-free transmission, the engines shortcomings blighted the cars progress. 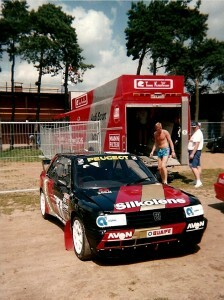 Ironically, the Peugeot's engine was one of the factors that Gollop decided to run with the 309 in '93. The necessity to created a minimum of 500bhp from a 'stock' engine governed that the eventual choice must have a strong cylinder block and decent head. Having lived with the handling imbalance of the short wheelbase, tail-heavy Metro 6R4 for six years, Gollop knew he wanted as close to a 100 inch wheelbase and 50/50 weight distribution as possible. The Peugeot 309 became the most likely option. 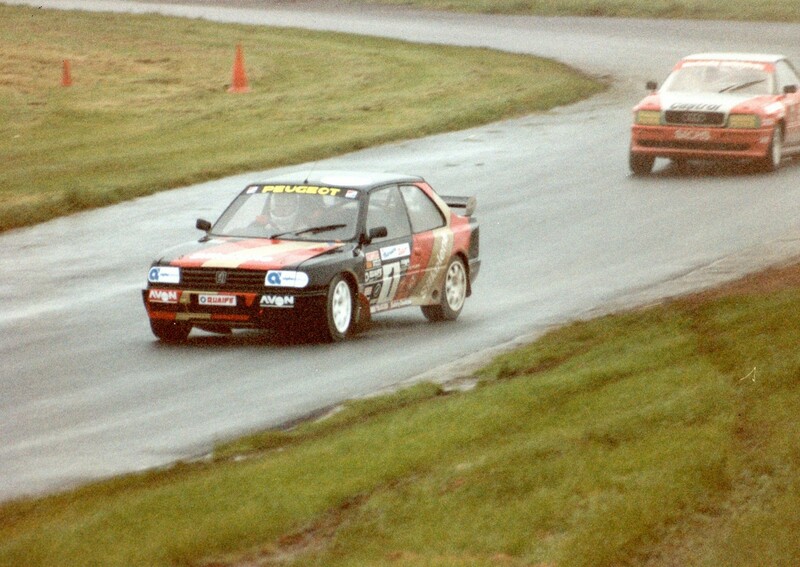 Mick Linford, boss of Peugeot Talbot Sport UK, was receptive to the idea and the deal was done! 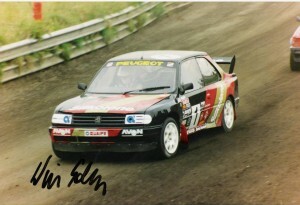 Although Gollop's was the official PST rallycross entry, Gollop received no financial support from Peugeot, who contributed just the basic parts to build the car. The FIA's Appendix M technical regulations for rallycross allowed wide-ranging modifications but Gollop built his car along the more conventional lines than some. Starting with a basic three-door 309 body, initial preparation centred on installing the fully independent double wishbone suspension set-up. At the rear this basically entailed removing a chunk of the floor and inserting the rear suspension sub frame from a Peugeot 205T16. 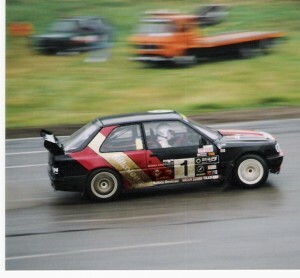 Although there were small modifications, essentially it is the entire unit from the rear end of the Group B car which controlled the rear end of Gollop's 309. At the front end there are also double wishbones and these were again sourced from the defunct Group B car. Locating the suspension, fabricating and sitting pick-up points was carried out with painstaking precision and, uniquely among the new breed of rallycross cars, with the help of a CAD system. Over the last couple of years with the 6R4 Gollop had been using Dutch-manufactured Proflex dampers with bespoke springs. The shocks were imported into the UK through GDB Motorsport and, although Gollop often worked direct with Proflex founder Reis Huisman, suspension consultant and GDB boss Gordon Birtwistle had been used since the units were first installed. When it came to building the Peugeot 309, Gollop was anxious to retain Proflex and so involved Birtwistle in the design stage of the suspension and continued to draw on his expertise as the car was developed. Using a CAD system allowed numerous theoretical possibilities to be tried before a single piece of metal was cut. The optimum theoretical design was taken from the computer, fabricated, fitted, tried and tested. The inner ends of the front wishbones pick-up from a substantial framework built into the engine bay. Fabricated box section chassis 'legs' run forward from the bulkhead to carry engine mounts and locate the top wishbones, while a drop section picks up the bottom wishbones. The back of the engine and front of the gearbox are mounted on a cross member, while a second cross member supports the rear of the gearbox. This set-up allowed a gearbox and/or clutch change in just 20 minutes. The dampers operate on the top of the upper wishbone and are housed in a fabricated turret that runs inside and slightly forward, of the original front suspension top mount. Blade-type anti-roll bars were fitted front and rear and the cast aluminium uprights carry 300mm vented brake discs onto which AP four-pot callipers operated. G-Tech did not use cross-drilled discs as Gollop's left-foot braking generated massive disc temperatures and cross-drilled discs had found to crack under such treatment. The 309 ran on 16 inch Dymag wheels with regulation maximum width 250mm Avon tyres. Once all the geometry had been designed and decided upon G-Tech took a back seat for a while and the shell was despatched to Safety Devices who installed a huge all-embracing roll cage. The roof was braced with a cross bar, the main hoop behind the driver is braced vertically, horizontally and vertically, a bar from the bottom left of the passenger footwell, passing across the top of the transmission tunnel, over the driver's knees and up to the base of the windscreen pillar. The tubes also extended backwards and forwards to the respective suspension points, making the structure very stiff! This was proved in the 309's first competitive outing, battling against throttle-lag, Gollop misjudged a corner and parked the Peugeot on its roof! Gollop's Peugeot lived to fight onto 7th place in the event. Aside from the roll cage, everything else was constructed by G-Tech, Gollop's own company, which, alongside motor sport preparation work took on engineering and fabrication work as diverse as trailers for articulated trucks to railings to keep sightseers off the grass at Canterbury Cathedral! The engine was tuned through 90 degrees and mounted longitudinally as far back as possible in the engine bay, leaving plenty of room for a sizable intercooler. Allowing room to install the front differential and drive line, which with the Quaife system was independent of the engine and sump, sees the cam covers rub against the closed bonnet. The engine breathed from the left so the steering column and power steering rack were fighting for space with the turbocharger and exhaust system. On the other side of the engine bay the plenum chamber is hard against the suspension turret. On the plus side the inlet tract from the intercooler to the plenum, for example, is very short and aids the engine efficiency. The long slender Quaife gearbox was encased in a magnesium casting and bolted to an aluminium bell housing. The gearbox shares the transmission tunnel with water pipes serving the rear-mounted radiator and exhaust pipe, which ran alongside the driver's leg. Drive was carried forward by a shaft that ran under the exhaust on the driver's side of the gearbox while the rear wheels were driven by propshaft picking up from the rear of the gearbox. Gollop claimed the Peugeot had no handling issues and the gearbox, whilst derided by some, proved to be faultless. Costing less than £15,000 at the time, it was half the price of an equivalent system from other manufacturers. The radiator sits between the rear dampers, drawing air from underneath the car and venting into the boot, separated from the driver by a full height bulkhead. The radiator was custom-made to fit Gollop's 309, as well as the aluminium fuel and oil tanks, also residing in the boot. The cockpit is sparse, the standard dash runs full width of the car, the instruments blanked out and replaced with a dominant Stack display system. A conventional rev counter is combined with a multi-function LCD read-out. Aside from a couple of switches, electrical kill switch, brake bias adjusted, fire extinguisher pull wash/wipe stalk and a boost know, that's it! A row of pop-out fuses is tucked away under the left side of the dash with the ECU and download socket for the data logging system. Quaife Transmission - Sequential Shifting Quaife's six-speed sequential shift gearbox lies at the heart of the Peugeot's four-wheel drive transmission system. The magnesium-cased unit, with its integral centre diff and step-off unit weighs in at 67kg, 13kg lighter than its alloy-wrapped brother. The sequential shift mechanism is an optional extra in the Quaife package and the gearbox can also be supplied with a conventional gate change. Gollop confirmed that the sequential shift takes a little bit of getting used to, especially having the presence of mind to sort it out in those heated moments when you find yourself looking at where you have just been! The gearbox used in Will's Peugeot is Quaife's 4x4 in-direct drive gearbox, which was the newer and slightly more efficient version of Quaife's two gearboxes,, the other, earlier gearbox taking drive through a pair of drop gears. Although Gollop ran the six-speed box, the basic unit was the same as for the five-speed box, the only difference being in the internal components. The centre diff and step-off unit were built into the gearbox casing and could house either a viscous coupling or Quaife's own torque-biasing differential. The torque biasing diff was set at a nominal 50/50 split but is, in effect, constantly adjusting the drive as the helical gears pressurise under load and progressively lock up the diff. The sequential shift system in the main area of development left in the Quaife system and at the time Quaife were working on an electronically-operated system that would bring the gear change on to the steering wheel, or wherever else might be desired. The reliability of the Quaife system was typical of the stout products produced day in, day out by the family-run business that was taken so much for granted in British motorsport. Quaife's involvement and contribution in the sport was often overlooked. Engine - Crank Critical The engine was built by veteran tuner Cliff Humphries, who Gollop teamed up with in his early 6R4 days. 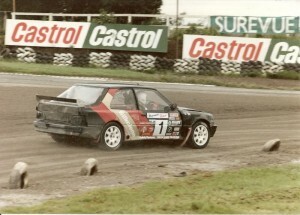 Cliff had experience of working on the Healey 3000s and Mini Cooper but his only experience of working with turbo engines was Tony Pond's 1980s Group A Metro. However, he rose to the challenge and created an engine that failed just one in three years! Using the alloy 'XU' series cylinder block the problems with the 309 engine stems from the old fashioned design of its internal components. Gollop quoted "It loves to rev, 10,000 is not a problem but the weight of the pistons and rods is too much and the crank is just not up to the job. We only need to make it live with the revs and we'll be in business". Humphries and Gollop realised from almost day one that the crank would be a problem, they either had to run the risk and run it until a new one could be made or sit out half the season, the decision was easy but two engines were destroyed in the process! Crankshaft lubrication is the source of the problem that has caused bearings to pick up and eventually, con rods to snap. Gollop; "You can see why Peugeot moved on to the 1900cc engine with the evolution two. What we have isn't terrible it's just not enough for what we're doing". Will Gollop on racing the 309 in 1993; "We started the season late as the new car took longer to complete than we anticipated. That in turn meant that we didn't get the opportunity to test properly and when the opening round of the European Championship at Lydden was cancelled, it proved to be helpful. Then we also had to miss Austria whilst awaiting new parts to be delivered and Portugal became the first event of the year for me. I finished 7th overall despite suffering severe throttle lag and having christened the car with a roll in practice!" "In France then engine blew up in practive which meant a speedy return home to have the engine rebuilt for Ireland the following weekend. I had my doubts whether it could be done in time but it was and I finished a good 3rd at Mondello Park. I thought this must the upturn in fortunes, but not so! In Sweden at the beginning of July, the engine blew up yet again and this time there was no choice but to miss Finland the following weekend and the Inter Nations Cup just after that. In mid-August we went to Arendonk in Belgium, where I managed a 'B' Final finish amidst fuel-related problems. A week later in Holland, things seemed to be picking up again and I finished 4th with the car running well in the very wet conditions and the dry." "The final two rounds of the championship in Norway and Germany also yielded 'B' Final sinishes to complete our worst season in Europe! However, developing a new car is always difficult, especially if you are the only person running a car of that type."